Over the past few months we have seen increasing adoption of AMD Ryzen processors by makers of ultra-compact form-factor (UCFF) desktops. At present, the number of UCFF systems powered by AMD’s Ryzen is not large, but it is growing. On Tuesday HP announced its first small form-factor commercial desktop powered by AMD’s Ryzen Pro 2000-series. Measuring 177×175×34 mm and weighing 1.26 kilograms, HP’s ProDesk 405 G4 is among the most compact desktop computers based on AMD’s Ryzen available today. The machine can pack AMD’s quad-core Ryzen 5 Pro 2400 GE processor with Radeon Vega 11 graphics that can be paired with up to 32 GB of DDR4 memory, an M.2 PCIe/NVMe SSD and a 2.5-inch HDD. The system consumes up to 65 W of power supplied by an external power brick. Connectivity-wise, the ProDesk 405 G4 provides an 802.11ac + Bluetooth controller (from Intel or Realtek), a gigabit ethernet port, six USB 3.1 Gen 1 ports, a DisplayPort 1.2 with MST, and optional connectors (including USB 3.1 Gen 2 Type-C, HDMI 2.0, D-Sub, Serial, etc.) based on the specific sub-model. HDMI 2.0, D-Sub, Serial, etc. P BIOSPhere, TPM 2.0, etc. Apart from compact dimensions and versatile connectivity, HP’s ProDesk 405 G4 also boasts with DASH manageability, a TPM 2.0 module, as well as HP’s Sure Click, and BIOSphere technologies to ensure security against common attacks. The latter are particularly important for HP’s commercial customers. 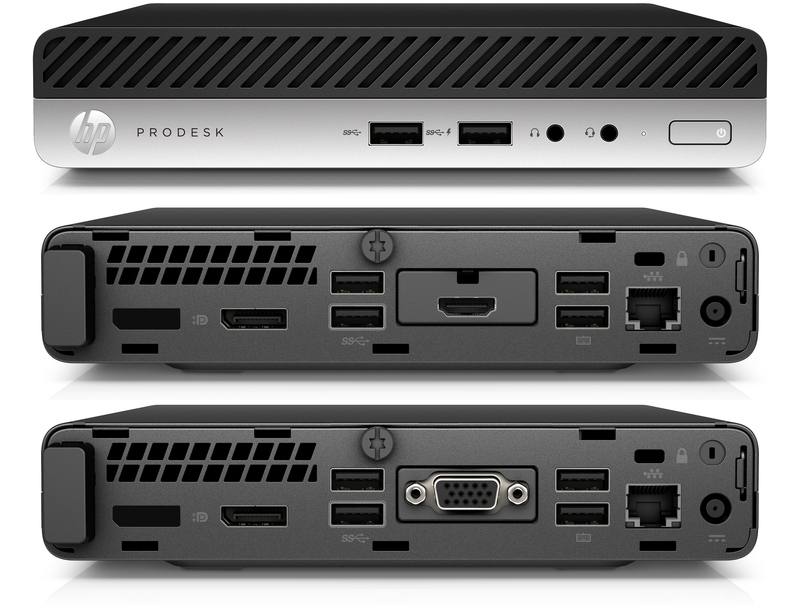 HP plans to start selling the ProDesk 405 G4 in April starting at $499.99.